Info "Take a picture--it'll last longer!" Snapped Shot is one of The Job Center's microgames in WarioWare: D.I.Y. 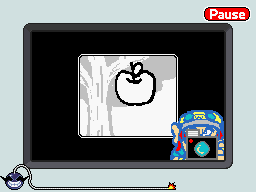 The player has to draw the things Wario photographs. In the original game, the player has to tap the screen when they see a butterfly or an apple falling in the square. If the players manages to keep the object inside the square when the picture is taken, the game is won. If they miss the object and time's up, the game ends in a loss. "In this game, I'm a photographer taking pictures of stuff flying by! Design two different things for me to snap!" This page was last edited on July 19, 2018, at 10:25.